Some pretty big news out this week about background checks. 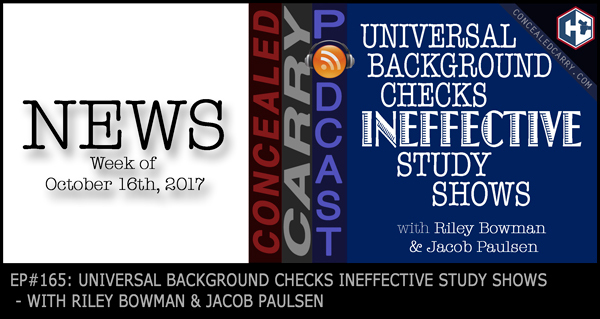 A three year look back at the effectiveness of universal background checks in Colorado and Washington forced the author of that study who “wanted to see a different result” to admit that there has been no measurable impact on crime reduction. This plus tons of other great analysis on many other stories including a couple of JUSTIFIED stories that have some critical lessons to learn from. Hit the ‘PLAY' button and listen in now!! Paul Ryan Challenger Bump Fires Rifle Without Bump-Stock, Asks: ‘Will Congress Outlaw Fingers? One indication of Californian interest in concealed carry would be how many of us have non-resident permits from other states. Personally, I have permits from Nevada, Utah, and Florida. Many of my friends do too.